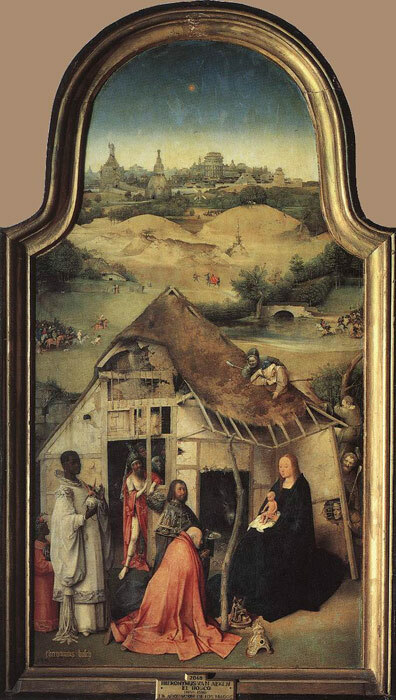 The central panel of the Triptych of Bosch represents the Adoration of the Magi. Several copies of the panel exist in various museums (Philadelphia, Amsterdam, Bonn, Avignon etc.). Bosch displays the adoration of the Christ Child by the three Kings or Magi. The Infant Christ sits solemnly enthroned on his mother's lap. The Virgin and Child resemble a cult statue beneath its baldachin, and the Magi approach with all the gravity of priests in a religious ceremony. The splendid crimson mantle of the kneeling King echoes the monumental figure of the Virgin. That Bosch intended to show a parallel between the homage of the Magi and the celebration of the Mass is clearly indicated by the gift which the oldest King has placed at the feet of the Virgin: it is a small sculptured image of the Sacrifice of Isaac, a prefiguration of Christ's sacrifice on the Cross. Other Old Testament episodes appear on the elaborate collar of the second King, representing the visit of the Queen of Sheba to Solomon, and on the Moorish King's silver orb, depicting Abner offering homage to David. Bosch depicts a group of peasants , gathered around the stable at the right. They peer from behind the wall with lively curiosity and scramble up to the roof in order to get a better view of the exotic strangers. The Shepherds had seen Christ on Christmas Eve, but they frequently reappear as spectators in fifteenth-century Epiphany scenes. Generally, however, they display much more reverence than do Bosch's peasants, whose boisterous behaviour contrasts strongly with the dignified bearing of the Magi. The most curious detail of Bosch's Epiphany is the man standing just inside the stable behind the Magi. Naked except for a thin shirt and a crimson robe gathered around his loins, he wears a bulbous crown; a gold bracelet encircles one arm, and a transparent cylinder covers a sore on his ankle. He regards the Christ Child with an ambiguous smile, but the faces of several of his companions appear distinctly hostile. Because they stand within the dilapidated stable, time-honoured symbol of the Synagogue, these grotesque figures depicted by Bosch have been identified as Herod and his spies, or Antichrist and his counsellors. Although neither identification is quite convincing, the association of the chief figure with the powers of darkness is clearly suggested by the demons embroidered on the strip of cloth hanging between his legs. A row of similar forms can be seen on the large object which he holds in one hand; surprisingly, this can only be the helmet of the second King, and still other monsters decorate the robes of the Moorish King and his servant. These demonic elements undoubtedly refer to the pagan past of the Magi. Behind the stable in the centre, the followers of two of the Magi rush towards each other like opposing armies; the host of the third King appears beyond the sand dunes. The gently rolling countryside contains, in addition, an abandoned tavern and a pagan idol. Even the distant grey-blue walls of Jerusalem, one of Bosch's most evocative renderings of the Holy City, appear vaguely sinister. SPECIAL NOTE : The painter will make the reproduction as close to the original oil painting as possible. If you want your painting to alter from this likeness, please email us and " Adoration of the Magi, c.1510 " will be reproduced according to your special requirements.